Another lovely day, leave much earlier today and join the road north. I'm starting to find the going a little easier, especially when the road is flat. 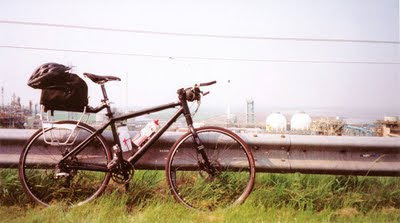 The first 15 miles through Cheshire countryside and small towns are delightful, but then I reach Runcorn and Widness and it feels like a different planet - dual carriageways, chemical plants and a very hairy river crossing. 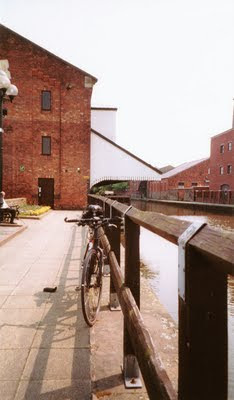 After Warrington things improve and I have my lunch by Wigan Pier- made famous by two Georges, Formby and Orwell. George Formby sang about it, ironically I assume, while George Orwell's Road to Wigan Pier catalogues the deprivations of the northern English poor (and it wasn't even there by the time he visited, much to his disappointment). Brighton and Clevedon it certainly isn't! Amazingly I managed 50 miles before lunch, which means a far shorter afternoon. The last 20 miles are hilly, but still feel fine. Arrive in Lancaster and find the pub we are staying in - don't think Clare will be impressed. Tomorrow is a day off too!